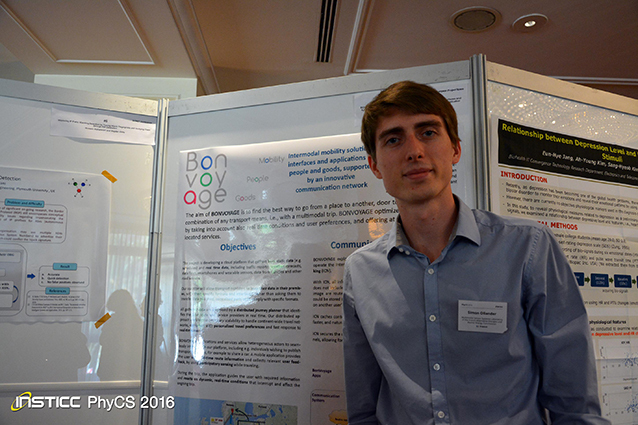 BonVoyage has been presented to the PhyCS 2016 congress with a focus on how physiological data could be used to assess the user’s stress level for optimizing travel planning solutions through a user’s profiler tool integreted in the BonVoyage smart travel planning platform. During the conference held on 27th and 28th July in Lisbon, CEA – LETI presented the Bonvoyage Project and exhibited the project poster. PhyCS congress is the annual meeting of the physiological interaction and computing community, and serves as the main international forum for engineers, computer scientists and health professionals, interested in outstanding research and development that bridges the gap between physiological data handling and human-computer interaction.